Cross posted by Richard Landes at Augean Stables under the full title: “The Dead Baby War: Reflections on Palestinian Thanatography and Western Stupefication”. Max Fisher, formerly of the Atlantic Monthly, now the WaPo’s “foreign policy advisor,” just posted a reflection on the war of images in the current Gaza operation. In it he makes every effort to be “even-handed.” And in the end, comes up empty-handed. A remarkable example of how intelligent people can look carefully at evidence and learn nothing. If I didn’t know better (which I don’t), I might think he was doing some “damage control,” if not for Hamas (in which case, presumably it would be unconscious), then for the paradigm that permits him not to acknowledge Hamas’ character. Wars are often defined by their images, and the renewed fighting between Israel and Gaza-based Hamas has already produced three such photographs in as many days. In the first, displayed on the front page of Thursday’s Washington Post, BBC journalist Jihad Misharawi carries the body of his 11-month-old son, killed when a munition landed on his Gaza home. An almost parallel image shows an emergency worker carrying an Israeli infant, bloody but alive, from the scene of a rocket attack that had killed three adults. The third, from Friday, captures Egyptian Prime Minister Hisham Kandil, in his visit to a Gazan hospital, resting his hand on the head of a boy killed in an airstrike. 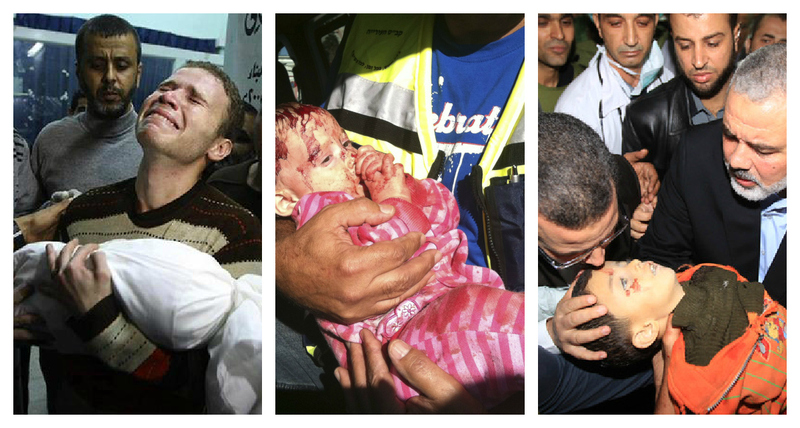 Each tells a similar story: a child’s body, struck by a heartless enemy, held by those who must go on. It’s a narrative that speaks to the pain of a grieving people, to the anger at those responsible, and to a determination for the world to bear witness. But the conversations around these photos, and around the stories that they tell, are themselves a microcosm of the distrust and feelings of victimhood that have long plagued the Israeli-Palestinian conflict. The old arguments of the Middle East are so entrenched that the photos, for all their emotional power, were almost immediately pressed into the service of one side or another. Actually, there’s a huge difference between the sides. Israel has, over the years, shown enormous reluctance to use the photos of their dead and wounded to appeal for public sympathy; whereas Palestinians have actually created victims in order to parade their suffering in front of the public. Indeed, Palestinian TV revels in pictures of the dead (so much so, that when my daughter wanted to help me with some logging of PLO TV footage, I had to decline lest she be brutalized by the material). They systematically use the media to both arouse sympathy from an “empathic” West, and to arouse hatred and a desire for revenge among Arabs and Muslims. Nothing uglier. Israel, on the other hand, studiously avoids pictures of the dead, and only a shocking incident like Ramallah can break those taboos. They were so reluctant to exploit these images that, even at the height of the suicide campaign (2002-3) they refused to release pictures of the dead victims. The two cultures could not be more different on this score, and yet, Fisher has no problem finding his symmetry. To obfuscate this fundamental difference with a pleasing even-handedness symbolizes the literal stupefication of our culture that necessarily accompanies the politically correct paradigm (PCP1), founded on a dogmatic cognitive egocentrism. It forces one not to see critical information. It’s as if we were under orders to not notice everything that a good detective should pick up on, as if we were required to assist the clean-up crews that want to frame the story to their advantage. In such a world, the protagonists of the Mentalist, Lie to Me, Elementary, CSI, House, are not merely unwelcome, they are banished. When it comes to seeing the more than obvious differences between Israel, a western style democracy, and Hamas, a clerical fascist genocidal regime, the press plays Sergeant Schultz from Hogan’s Heroes. I’m surprised you (Richard) didn’t mention that a) the middle picture has been tweeted as if it was a Palestinian child killed by Israel, and b) the picture on the right is actually of a child killed by a Hamas rocket that fell short. This abuse of dead/injured children is simply abhorrent, and I am aghast at the total indifference to it amongst the western media. Oh – and before Nat chimes in… Yes, I am horrified by the violent death of ANY child, of whatever race, religion or nationality. I wish no children would die this way. More than 20 children have been reported killed in Israeli airstrikes on Gaza. Some less than one year old. Why do you want to hide the reality of war? Richard’s post doesn’t explicitly bring out the most important differences between the photo of the wounded Israeli child and the two pictures of the dead children in the Max Fisher article. Still less does Fisher. Firstly, unlike the two images of Palestinian child corpses on display in the images created by Hamas-approved Palestinian photographers at the left and right of the triptych here, the image of the Israeli child is of a live, wounded child. It was not posed, and has been taken as an ambulance was passing the photographers, of the child being carried by emergency responders to hospital treatment. Secondly, the Palestinian images were the result of staged posing, and, in the case of the dead child to the right, were posed specifically and repeatedly with the same corpse in order to create anti Israel propaganda. And they were then taken up and presented uncritically by such Western media as the Washington Post and the UK’s Mirror as if they were spontaneous happenings. Even worse, in the case of the image on the right, the dead child concerned was almost certainly killed by Hamas or Islamic Jihad weaponry falling short of its target, rather than by an Israeli strike. I’ve blogged on the grotesque process of construction involved and the complicity of the Western media organizations which chose to run it without exposing the obvious evidence of that construction. Overall, it confirms the general tenor of RIchard’s analysis. Judy, the photos of Palestinian children killed in Israeli airstrikes were not “posed”. When you’re busy trying to find women and children buried under rubble after their house was hit by an airstrike, you have no time to “pose”. More than 100 people have been killed in airstrikes and shelling on Gaza, including at least 20 children. Some less than 1 year old. And most of the killed were terrorists. Maybe they shouldn’t hide behind civilians. Even according to this viciously anti-Israeli organisation of 102 killed 62 were combatants. And now you can shove your faux piety up to your …. spouting the same mindless crap about the Mideast and “moral equivalence” among the combatants there that his self-reinforcing liberal fuzzy heads @ WaPo espouse.